Becoming Texan: Texas, You Got Milk? Beef is an important commodity here in the Texas Panhandle. I've talked about it multiple times, but cows are good at another thing too: making milk. Unlike beef cows, dairy cows have been selected for generations based on their milk production. And let me tell you, I sure do love me a good glass of milk with supper! My parents always told me growing up to drink my milk so I would have strong bones. I'd say it worked. I ended up growing to a strong 6 foot 2 inches, and I've suffered only one broken bone in my lifetime, which happened to be my thumb. I also remember my mother telling me to ease up on the milk consumption because I was going to drink us out of house and home. I still drink milk to this day like it is going out of style and love it! Seeing as how I'm a big fan of milk, I thought it only fitting when my friend Krista from the Farmer's Wifee suggested I write a post about Texas dairies. 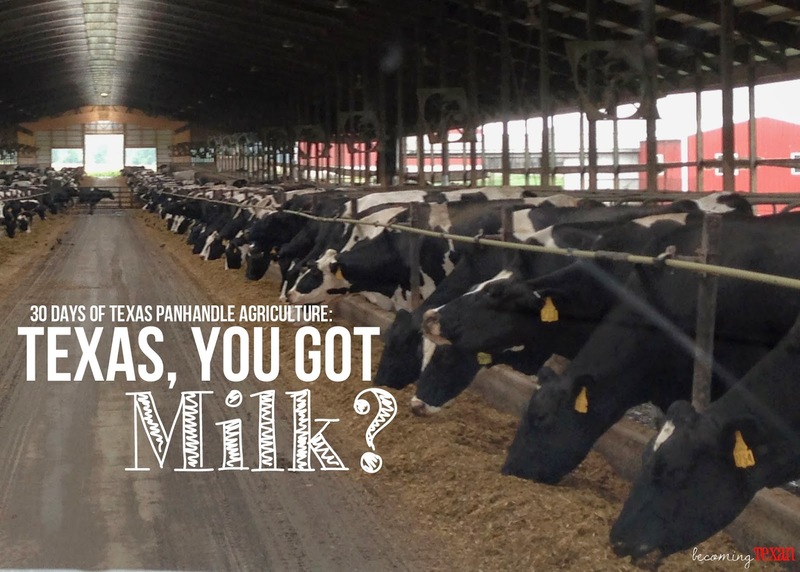 Here's the facts about dairies and milk production in Texas. Texas isn't the leading contributor of milk in the U.S., but Texas does rank number 7 for milk production, which is pretty awesome. 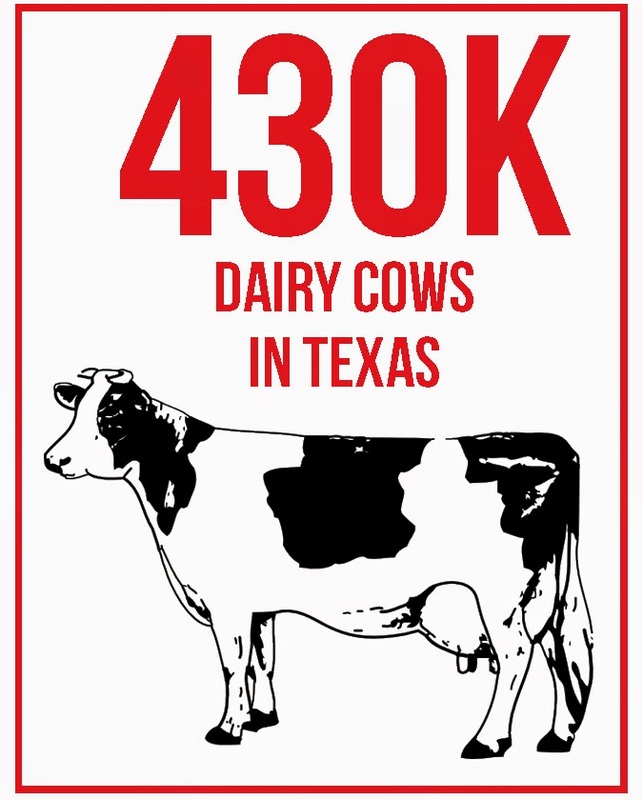 In the 2012 Census of Agriculture by the USDA NASS, Texas had only 985 dairy farms with a total of 430,000 cows. If you divide those evenly, that's around 440 cows per farm, which is fairly large in dairy standards. In Wisconsin, the second largest dairy state (behind California), the average farm has only 110 cows. Another fun fact about Texas dairies: they produce enough milk for one billion gallon jugs full of milk per year. That's a lot of milk! I checked and rechecked my math on that statistic because it just didn't seem possible, but that, folks, is a fact. I checked out the USDA NASS data on a county level to determine what the Texas Panhandle contributes in the grand scheme of Texas dairy. However, I found some large gaps in the data (mainly missing a large dairy in the county I reside in) so I've decided not to share it here today. I'll do some more research and get back to you. 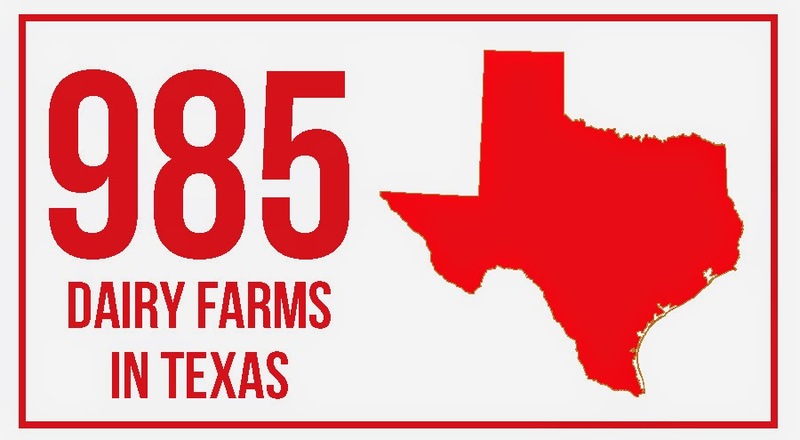 The moral of the story is: Texas may not be a California or Wisconsin in terms of dairy, but Texas still contributes around 5 percent of the total dairy in the U.S. Again, Texas has proven that everything may be bigger in Texas. This is the 17th day (posted on the 19th day of November) of my 30 Days of Texas Panhandle Agriculture series. To read more, please visit this introduction post. If you have questions or ideas you'd like me to write about concerning Texas Panhandle agriculture, I'd love to hear from you!